The “Blockchain” is still an emerging revolutionary technology. It is steadily transforming the financial relationships between people and businesses globally. “The Age of Blockchain: A Collection of Articles” is a free eBook published by the team of IndraStra Global Publishing Solutions under the imprint - IndraStra Open Access. The book contains a set of selected articles which were published at indrastra.com in recent times. These curated collections are of value because they bring together important point of views on blockchain technologies and explore what this revolutionary technology will mean for governments and global businesses. 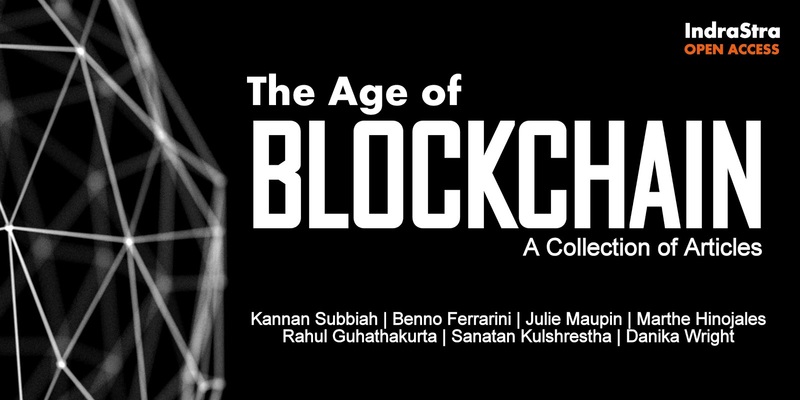 The first article is written by Kannan Subbiah, discussed some of the key strengths that drive the adoption of the blockchain technology world over. The second article is about Digital Identity, written by Dr. Benno Ferrarini, Dr. Julie Maupin, and Marthe Hinojales. It provides a cost-benefit analysis of distributed ledger technologies (DLT) and its application in developing and maintaining national or global identification system in the digital sphere. The third article by Rahul Guhathakurta discusses the application of blockchain technologies in the automotive industry. It highlights the upstream and downstream applications of blockchain and discusses the fundamentals of scalability and interoperability which can benefit many stakeholders in the automotive domain - from the supplier to manufacture and from manufacturer to end-user. The fourth article is written by Rear Admiral Dr. S. Kulshrestha (Retd. ), Indian Navy. It's about the current stage of evaluation of the military application of blockchain technologies in areas relating to military logistics, procurement and finance, Internet of Things, and other applications of interest to the military. The last but not the least, the fifth article by Dr. Danika Wright enlighten the readers on how blockchain could transform the way we buy and sell real estate by doing away with the hidden costs and inefficiencies in our existing real-estate markets. NOTE: The ebook is available for free download at Google Books, Scribd, and IndraStra Global Open Repository - IGOR.